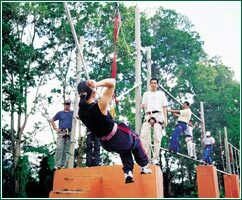 Team-building is one of the resort's attractions, especially for convention groups who enjoy the various challenging outdoor activities. The refreshing cool air of the highlands creates the perfect setting for outdoor team building activities. The activities designed byexperts help develop and foster greater team spirit, better working dynamics and provide excellent team building experiences. What an excellent way to relax after those endless meetings and discussions! Arrive at Hotel for Registration. Ice Breaking, Briefing and Team Allocation. Obstacles Course: - Commando Carry, Commando Crawl, Confidence Rope (Fire wall), River Crossing (Sea) Spider Wall etc. Free and easy - until check out. Water Confidence, Raft Building and Rafting Race. Treasure Hunt / Explorace - THEME CSI - Crime Scene with Fear Factor. Night Line - Night Solo Walk. Prize Presentation, Closing and Evaluation. Copyright © 2014 by Impressions Events Management Sdn Bhd.All rights reserved. Marketing for Homepage design and hosting by Impressions Events Management Sdn. Bhd.